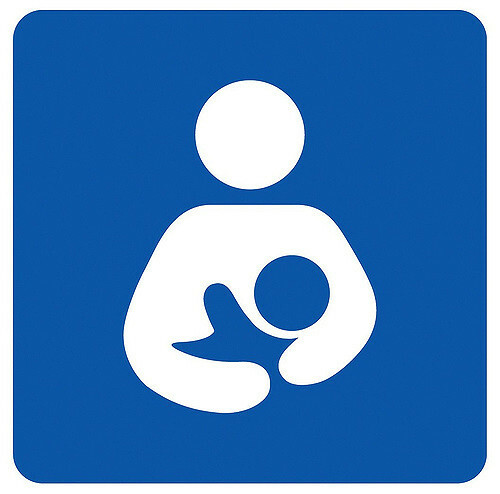 Oftentimes, breastfeeding happens in spaces that are out of the public eye in spaces like homes, birth centres, hospitals, child-centred settings, and ‘nursing’ rooms. But what are mothers doing outside of these settings? Typically, breastfed children, especially babies, nurse frequently – anywhere from every hour to every 2-4 hours. It can then be reasonably expected that a mother will need to breastfeed her child in a public space on a fairly regular basis. Why should breastfeeding be more visible? What can you do to support the visibility of breastfeeding? Create a welcoming environment in your workplace, service space, community space, and let everyone know that you support and encourage breastfeeding anytime, anyplace. There are already many resources and ideas available to draw from in Ontario. You don’t have to be engaged in maternal/child health work to support breastfeeding publicly. Anyone, any group, any place can show support. A quick web and social media search will generate many ideas for logos, images, hashtags that you can use to publicly support breastfeeding. Put up posters in heavily trafficked areas, add a logo to your website, share supportive messaging via your social media channels. Formal and fun materials can be easily found. The Baby Friendly Initiative of Ontario, in partnership with York Region Public Health, produced a series of posters in English and French that can be downloaded. Just Food, in collaboration with Ottawa Public Health, developed this welcoming sign that could easily be adapted. And to remind everyone that it’s not just babies who breastfeed (the recommendation is to continue to breastfeed till the child is at least 2 years old), the Public Health Agency of Canada developed this poster in English and French. For further inspiration on multimedia campaigns, check out the Kids First Huron-Perth’s ongoing initiative to encourage breastfeeding and breastfeeding in public. The campaign included life-sized cutouts and posters displayed across the region (including on public transit), videos, posters, blogs, and social media groups. There are many fabulous short videos that capture the experience of breastfeeding from the perspective of parents. “Je l’ai fait / I did it” by INFACT Quebec features women talking about all the places they have breastfed. This video (Nursing is Normal / Allaiter partout…simplement!) is a photo collage of women breastfeeding everywhere. Toronto Public Health also produced a series of short videos in support of breastfeeding in public. For some activities, the Ontario Public Health Association’s “A Breastfeeding information and Activity Toolkit for Secondary School Teachers” / “Trousse d’information et d’activités au sujet de l’allaitement maternel à l’intention des enseignants du secondaire” can be adapted to various audiences. Just Food, a non-profit organization based in Ottawa, created a bilingual kit for businesses to use which can be easily adapted for other purposes. The kit - Breastfeeding Friendly Business Toolkit (EN) and Projet des Entreprises Favorables à L’Allaitement (FR) includes simple, practical steps to follow and tips for staff to use to show support. Likewise, the Simcoe Muskoka District Health Unit also produced a guide on becoming a breastfeeding friendly place in English and French. For the workplace, the Ontario Public Health Association created a guide to Creating a Breastfeeding Friendly Workplace and Ottawa Public Health has a sample workplace policy available in French. The Grey Bruce Health Unit also has a toolkit for creating Breastfeeding Friendly Businesses for clients and employees. Learn what community resources are available that support breastfeeding. A simple start can be browsing Ontario’s online breastfeeding services directory and learning more about 24/7 telephone support available via Telehealth Ontario. Peer support, in particular, and seeing and connecting with other people who are breastfeeding children of varying ages has been shown to positively influence breastfeeding. If you would like to consider starting a peer support program, check out Best Start’s guide to Developing and Sustaining Breastfeeding Peer Support Programs. Breastfeeding in public can be anxiety-provoking for some - a proactive offer of tips/ideas on things to consider when breastfeeding in public might help for those who don’t find it intuitive. Teresa Pitman, renowned breastfeeding advocate and author of numerous breastfeeding books, offers some practical guidance for breastfeeding in public for those who want some help getting comfortable with it. Along with these tips, it is helpful to be able to share this information on what someone can do if they are asked to stop breastfeeding in public. There are so many more ways to support breastfeeding in public. Public Health Units in Ontario offer a range of supports and signage to help you promote breastfeeding and there is much more information available about breastfeeding, in general, via www.beststart.org and www.breastfeedingresourcesontario.ca. And, of course, there are the simple things you can do when you see someone breastfeeding anywhere – offer a seat, thumbs up, word of encouragement, a glass of water, or just smile “The Places You’ll Feed” is a variation on a Dr. Seuss classic that offers humourous homage to the pride, hilarity, frustration, and deep satisfaction that comes from breastfeeding a child in public and private spaces. Whatever you do, do not ask a breastfeeding mother to move because someone else is uncomfortable with seeing her breastfeed and, under no circumstances, should anyone suggest that a child be breastfed in a bathroom. Sudbury & District Health Unit got the message right in this video – there is no need to hide! Need more inspiration? Listen to Bernadette’s touching personal perspective on breastfeeding in toddler years, tandem breastfeeding, and breastfeeding in public (French only). And then go and show your support for breastfeeding and breastfeeding families anytime, anywhere!